It can’t be said enough that the cliché “There’s no ‘I’ in team” is completely relevant in major league sports, but the way the Nationals pitching staff appears to be playing this season it’s hard to believe they’ve taken it to heart. Stephen Strasburg is the obvious choice for an ace after coming into the mix two months after Opening Day. 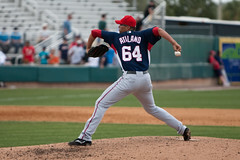 Livan Hernandez continues to prove why he was added back onto the roster during Spring Training, especially after two complete games this season. But what about the rest of these guys? There’s an “I” in win, but that should be of no consequence. The selfish desire to stay in the game and on an active roster when you know full-well you’re not pitching at your optimum game hurts not only your personal career and health but your team and franchise. Right-hander Luis Atilano has been placed on the 15-day disabled list because of a sore right elbow as of Thursday afternoon. Atilano has a history of elbow problems and did have elbow reconstruction surgery a few months before the Nationals acquired him from the Braves for outfielder Daryle Ward in 2006. What is most troublesome about Atilano going on the DL isn’t necessarily his elbow problem itself but rather the selfish reasons as to why he didn’t go on it sooner. He wants to pitch. That’s why it took so long for him to say his elbow was sore? Sound familiar? Two names should come to mind: John Lannan and Jason Marquis. One is the Nationals Opening Day starter for the past two seasons. The problem? His sinker (i.e. his best pitch) wasn’t sinking. The other is a near $15 million investment. The problem? He went on to post a 20.52 ERA before getting checked for and admitting there was a medical problem (i.e. bone chips). This isn’t the Nationals fault as an organization as much as it’s the players pride getting in the way. To go even further, this isn’t an attack on Atilano, Lannan, or Marquis’ character but rather a proposed call to duty. Baseball, just as much as any team sport, is just that – a TEAM sport. Any one player can make or break the squad’s standings on a season if they don’t pull their weight. By placing pride in the forefront, they’re hurting the team. The Nats starting rotation has been an issue since day one of the 2010 season, but it also doesn’t help much that their offense is about as bi-polar as any line up in the big’s at the moment. One second they’re on fire and next they’re asleep; there’s no telling when or where the shift from slump to burst will take place. Not even Manager Jim Riggleman can fix this. It’s up to the team and the players to get outside their own heads and start thinking about the others on their team and how one singular action has an effect on everyone else.